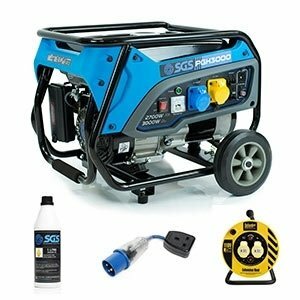 Here at SGS Engineering, we have a wide range of generator sets, kits and bundle deals that include both a quality generator and all the accessories you need to keep these in top working order. Our exclusive generator sets range from smaller bundles like our 2.8 kVA heavy duty portable petrol generators through to 8.1 kVA petrol generators that come with electric start, wheel kit, oil, fly leads and twin outlet cable reels. These generator kits are ideal for trade and professional use as they can come with everything you need to keep working for longer. Also, our bundle deals are a great choice if you’re looking to save on the cost – as it can be more affordable than buying all the individual components. You can select the generator bundle you want from our listings and place an order online. If you order before 4 PM you can also enjoy next working day delivery. All our generator kits and sets have a 60 day returns policy in place as well as different warranties. You can see the warranty offers on the individual product pages and by viewing our ‘Warranty Information’ page. 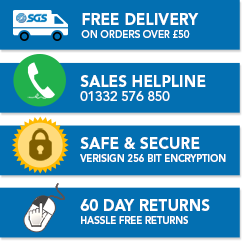 For any other enquiries or for additional buying advice you can get in touch with our team via email sales@sgs-engineering.com or via phone on 01332 576 850. If you’re not sure which generator kit or bundle is the best choice for your circumstances, then be sure to take a look at some of our useful buying guides. The links below can help point you in the right direction and see you make an informed decision on which of our deals is the best fit for you. - Find out more about our generators and use our advice to select the right model. - Browse our advice guides to find out everything from how to safely use our generators to how and when they can be used.